Have you ever been invited to a dinner and wondered what you should bring along? Sometimes, I run out of ideas myself… So I have managed to put together a list of some nice things as an ideal or correct gift. On the occasion of a dinner (with the exception of a birthday dinner), I would like to bring with me something that can be shared among all the invitees. But it is not wrong to gift the host something more personal, by that I mean, something that he could only use. Also I believe that the price and the size of the gift are relevant/ proportional to the size and importance of the dinner. If you want to make the host happy and I think you must want to, focus on what the host will like as a gift. A bottle of wine or holiday flavored liquor: Ask for a good wine and you can never go wrong with this. Something Crystal for the house (Ideal for a corporate dinner): an ashtray, a vase, a candle holder, etc. Flower arrangements in a vase: Except that girls don’t get flowers to guys. It is my grandma who once told me that with such poise that I felt it makes sense. Sorry girls but there are other things on the list you can choose from. See what's next! Plant in a decorative pot: It's always nice to have some flowers around the house, don't you agree? a mixture of dried petals and spices placed in a bowl to perfume a room. A basket of teas: Think of it as lovely in the morning, after a meal, or when you feel sick, definitely a heartwarming gift! A doggie treat: That's very different from everything else on the list. It is most suitable for a casual dinner and you and the host should not be total strangers--you should be a billion percent sure that your friend has a dog and it is still alive lol, otherwise it would turn out to be beyond insulting as a gift. Dessert from a pastry shop (never from a bakery, usually not good enough unless if it is Pain D'or): it will be a cake or a bunch of Mignardises (yumyum). Usually, I go to Paul for Mignardises because it is close to my house. For the Mignardises, make sure to fill the box or choose a smaller box. If you were thinking of getting a cake from Paul, I would only recommend the three chocolate mousse cake or the strawberry Charlotte. If you want to stand out, you can get for 50,000 L.L. 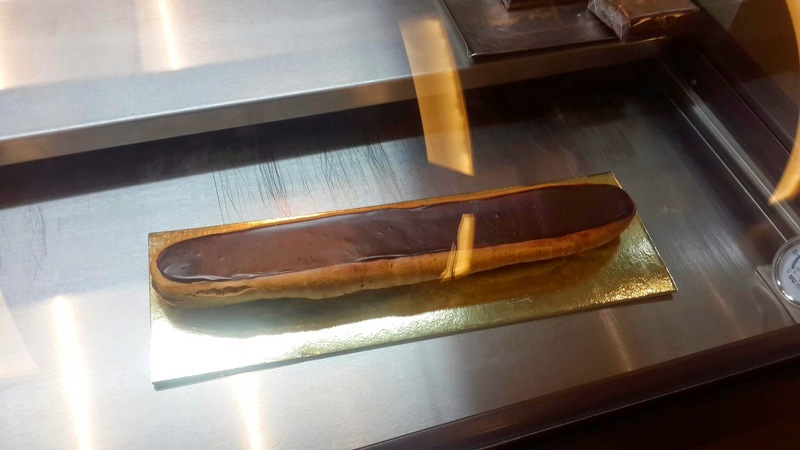 in a very special and uniquely designed box, wait for it, a one-meter Eclair au Chocolat from Pate a Choux (I have seen it in the shop on Sodeco street and have been craving for it ever since). Ice cream: Preferably ice cream cake; boxes and kilos of ice cream somehow look cheap, unlessyou are going to a super casual dinner with close friends and, WHO CARES!